QUEBEC – Montreal-based Yorbeau Resources has intersected high grade massive sulphide mineralization in two holes in the gap at the Caribou lens. Hole CAR-31W returned 2.9% copper, 6.9% zinc and 44.4 g/t silver over 2.5 metres at a depth of roughly 750 to 760 metres. Hole CAR-30E assayed 6.6% copper, 9.7% zinc, and 63.4 g/t silver over 0.8 metre just short of the 790-metre mark. Longitudinal section of mineralization at the Caribou project, looking north. Credit: Yorbeau Resources. The Caribou project is about 95 km northwest of La Sarre and is accessible by public and logging roads. It is the site of the former Estrades gold mine. 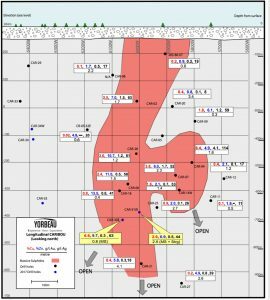 Yorbeau has targeted the western extension of the former mine where a thin but high grade massive sulphide lens was first drilled in 2009. Massive sulphides at the Caribou project remain open at depth. More information about the Caribou project is available at www.YorbeauResources.com/en/index.